After AllPeopleQuilt.com changed their blogs I moved my blog over here. I have recently found the Design Wall Mondays at http://www.patchworktimes.com/ by Judy L.
After lurking for a couple weeks, I thought it was time to make a contribution. My developing "leaders and enders" project is at a standstill. I am hoping to hit the LQS this morning to see if I can find more of the dark brown. That is all I have. I am going to replace the turquoise with the dark brown. Because of the smooth fabric, everything keeps falling off! UGH! So that part is alittle disheveled. I am hoping for the old farm look, but if you don't have the turquoise 1/2 squares in there, you can't see the pattern. The other project that I am working on is the "Wedge Works II" pattern by Cherly Phillips. It is time to step outside my comfort zone and teach a class at a LQS. This is an older book and is a 3 dimensional block with not much more than stitching the wedges together. Here is my sample before I cut into the real fabric. And below is the real fabric. Can't wait to get started on the real thing. Still can't figure out what I am going to do with the sample. I can tell you that the brown stripe for the center points is nothing but skinny little strips. I could not even get the last triangle out of it, one of those points has a seam running almost through the middle. Beth asked--If the quilts are for something such as a raffle quilt. They are not. Many of my quilts leave the house. Marriages, babies and such are starting to slow down and more of the quilts have no home--I like the way Bonnie Hunter puts it in "Quiltville"--if we were painters no one would ask why we are painting another landscape...or painting again. It is part of the artist. These quilts are because I have more fabric and I believe that there are many fabulous quilts stuck in my stash waiting to get out! I am excited to get them out. Now if I could just get some more of them quilted. I thought that I would follow that up with something about our guild. Our guild is quite large--almost 350 members. We have a show every other year & a "Sewing Expo" on the off years. We have continuous Charity projects. Several of us cut out fabric ( I love to cut)--the committee put the together "pizza boxes" with everything needed for a quilt. Members that love to sew--sew them up. Sometimes the members quilt them, others turn in the completed top and several members get together every month and tie the other ones. We have fabric swaps every other month, and blocks to raffle every other month or so. We are blessed with national speakers-- Carol Doak is coming soon! We have 2 retreats a year and buses that will take you to regional shows. We have the "Show and Tell" at the end of every meeting. Members teach classes along with the speakers that come into town for the meetings. Many of the members have smaller "Sit N Sew" groups. There are groups that meet at the churches, libraries--more than 1 and at historic homes that open to the public. They have even set up mini retreats. These let you bring your stuff and leave it there for the weekend. You just can't sleep there. But no distractions and lots of quilting friends who can help you get over the hard parts of the badly written pattern. I will say that a guild is what you put into it. If you participate you will make friends and stay busy. If you let others do all the work and just show up for the meetings once a month you might not talk to anyone for the whole meeting. Most guilds have so many long time members that sometimes the thrill of seeing the friend keeps them from venturing out to talk to others they don't know. Also I think some are quieter than the average person, at least until you get them talking about quilting. It is bed time for me. I am looking forward to working on a my projects tomorrow and lunch with a good friend. Stitch Niche asked me what we do with the 2 1/2" X 6 1/2" rectangles. I often cut for the guild. I am younger than most members (in my 40's) and have a little steadier hand and cut a little more accurate. The end product comes together better when you start with good cutting. Our favorite quilt to make simple squares with sashing and cornerstones. The muslin is for sashing. This will go with everything. You can mix up the blocks and make the whole thing scrappy and pull it together with a border. We also take some of the great fabrics that turned into uglies. These are often donated when they are no longer in style. We take the print and put muslin as sashing and use a matching cornerstone and the same cornerstone for the border. Often we take all the same color like blue/purples and make a quilt or below with florals. For a little more work you can set the whole thing on point. This is what was done here. After participating in many 6" floral swaps, I didn't want to look at them any longer (A watercolor quilt was calling me....it no longer calls me). Here is the quilt top I finished with muslin sashing. The muslin doesn't have the plain look it has in older quilts. The bright orange/red, yellow and blue keeps the muslin looking the cleaniest and brightest white and that makes it crisp. This muslin sashing is actually from the leftovers . It is cut 2" by 6" because that is what my floral squares were. I am so glad that I found a quilt to use up all those squares. I always say my favorites are the simple patterns that look like more than they are and let the fabric do some of the work for you. Man---Sometimes the stash just surprises you. I found a piece of brown that might work in my stash. What a pleasant surprise. Where did it come from you ask? Why from the Simple Abundance fat quarter bundle I won after quilt market in the fall! Check this pic out. I placed the fat quarter behind some of the other blocks. My hope is to have this quilt read as something you might find in an old farm house. I only have 1 fat quarter of it. I might look and see if I can find some more at the LQS. All the beige 1/2 square triangles were made with only 1 fat quarter--but there was 2 more FQ's available. This is the only one that is in the stash. Just hate to find myself a couple triangles short. I have not figured out how it will transition into a border. Here is the pic of the overall pattern. What do you think? The dark brown would alternate "stripes" with the beige stripe. These 2 simple blocks come together to look like so much more than what they actually are. My favorite kind of layout. On another note, our guild makes charity quilts like many guild, often I help cut. It is easier to take the fabric home and cut at my leisure within the next month. My all time favorite part of quilting is cutting, touching, ironing, straightening ( the OCD in me comes out), playing with the shapes after they are cut and trying to figure out what other usable pieces I can get out of the small chunks that are left. Here is the stack from yesterday. Here is the over 700 2 1/2" x 6 1/2" rectangles for sashing. The guild likes this pattern because if you have a whole lot of ugly fabric you can make it all go away. Help! My Design Wall Needs Help! My design wall needs some input. It is crying Help! to all you quilters. This has been my leader and ender project for awhile. Most things look good with a little black so I took fabric and made black 4 patches. Later I realized that I would have been better with scrappy 4 patches, but they were there so I tried to make something nice. I like the overall look of the project...BUT...I just placed the turquoise in to fill in the white to get an idea what the overall pattern will look like. It does not go with the rest of the colors. Now the hard part...what will go with the rest of the colors. I was thinking that the other strips of color surrounding the 4 patch squares would be darker than the brownish/tan that I have up there. I was thinking of another red but think that will look to strip like with the other reds in the quilt. We are in the midst of a very busy week. Over the weekend our oldest who is on the Speech Team had a competition about 2 hrs. away. She needed to be the school at 5am. The neighborhood homeowners association had the yearly meeting. The DH finally found someone to take over the presidency. The youngest played basketball between the JV and Varsity games. This game took place during the HO Assoc. mtg. After the Varsity game the bus rolls in to return the Speech Team. On Sunday, the oldest & 8 of her best friends had the rarely allowed sleepover. To keep the peace the youngest had 2 additional friends over! Nothing like 9 highschoolers and 3 elementary kids. (Poor husband--the only boy in the house.) A Twister tournament, hourly drawings (every ones name in the hat), and Band Hero marathon were entertaining to both the adults and the kids. The sleds came out and the air hockey tournament was fit in at about 10am. Upcoming is the Spelling Bee in 2 days. The oldest is organizing it. I am just the gopher girl. The quilt on the design wall is moving along. I need some advice on the colors. Thurs. I will get the pics on. I also managed to get some quilting done on the Sister to the Lodge. Though the quilting is figured out for the Christmas quilt, I haven't found time to work on it. One more day to work. Thursday the 3rd graders get a lesson on being in the spelling bee & the real thing on Thursday night. We have several upcoming events for our family. Lola is coordinating the district spelling bee. She participated in it for years. She even moved on to the regional bee more than once. Last year the coordinator decided to resign and I asked her if she would enjoy organizing the event she participated in for so many years. The bee is scheduled for Thursday, Jan. 21st. We still need to make the # tags for the contestants & judges gifts. Refreshments are available after the bee. Our family will contribute Chocolate Peanut Butter Oatmeal Rounds. I modified the recipe by adding 3 oz. of cool melted unsweetened chocolate. Just stir it in after the egg and butter. By making the dough today, baking will be a breeze on the day of the bee. After a brief stay in the frig, it is ready to be cut into easy cookie size pieces. Then the dough will go in the freezer and is all ready to just break apart and put on the oven. Cooking instructions along with the cookbook page are written on scratch paper and in the bag. Between laundry, exercising, and making up the cookie dough, I managed to work on some hand quilting. Check out the great swirls. Can't wait to finish this project. Some of the swirls are to large to leave. I am planning on starting the swirls going the other direction. This project was put on hold for awhile. Lost the darn thread. Just hate it when you know you put it in a safe place....you just can't remember where that place is! Thank you to my quilting buddies girlfriend. Yes, through the grapevine I ended up with 2 new spools of matching thread. Still haven't been able to find it in town, but I am back to quilting! In 2008, I had the pleasure of visiting Alaska. My family along with my mother and step-father had a beautiful trip that included a train ride and a cruise ship. We saw some beautiful places and I brought home some great souvenirs. Like many quilters, I would rather have fabric as a souvenir then a cup or spoon. While in Fairbanks, I stopped at a great shop just behind our hotel. I picked up a beautiful red, white and green print. Our family does not have a Christmas quilt and I thought this fabric might make a great quilt someday. 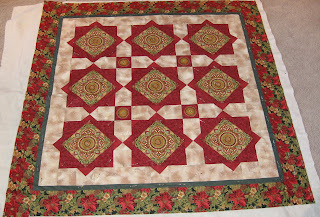 Around November, on the AllPeopleQuilt.com site, this picture of a lovely Christmas quilt kept coming up. Now, we have a slower internet connection than many of our friends (not dial-up) and I get the opportunity to look at some pictures longer than others as the page is loading. That month I saw the picture very frequently. I kept coming back in my mind to the fabric from Alaska. I took the brave step of cutting into the fabric, fussy cutting out the design that I wanted to highlight. Many times cutting into the prize fabric is sooooo hard. After the second square was cut, I was an old pro. This quilt worked up very fast. It can be found in the December 2009 American Patchwork and Quilting Magazine. The green stripe and the Christmas border print were purchased at the local Hancocks on 50% Christmas fabric. The other fabrics I found in the stash. I have just figured out the quilting. For me, this is one of the harder things about quilting. The quilt top was made in secret and found under the tree on Christmas morning. The family always knows that these quilts are not going to leave the house. So many times quilts are made and then given away. The family always enjoys having one that will stay here. The background fabric is a Fossil Fern that is left over from the KING. I thought that it looked like snow falling from the sky. I hope to have a quilt or 2 completed by March. This is one of them! I have made the conversion. I hope that I like it over here. It will take some time to get acquainted with the new set up. I show that I have been blogging at Allpeoplequilt.com for almost 2 years. I started in February of 2008. I have printed and saved the previous blog for the family to read at a later date. For those new readers--I am a woman in her 40's with a great family. We live on a small lake just off the Mighty Mississippi River. I work part-time in the medical field. My husband and I met in college and have 2 beautiful girls (Lola & MJ). I have been quilting for over 15 years. I love patterns that have simple piecing but looks harder than what it is. I like to let the fabric do some of the work for me. Hope to get the site personalized soon. What is taking so long. I thought I posted my first blog here. I am so used to changing the time from my other post that I think I set it to post way in the future. I will try this one. I am now thinking that it will post in 2 minutes!! !